Blood pressure measurement and management is an integral part of healthcare. Regular blood pressure checks can provide early detection of disorders and lead to long, healthy life. At the forefront of blood pressure management is ADC's Diagnostix™ 972 Series Mobile Sphygmomanometer. Physicians and other healthcare professionals may rely on the sleek, attractive sphygmomanometer for maximum accuracy, while improved safety features ensure use without worrying about mercury spills. This item is customizable. Please see below for customization instructions. The virtually indestructible, die-cast aluminum and ABS housing protects the sphygmomanometer without sacrificing on visual appeal. White oversized numerals on a contrasting black scale combined with high visibility red graduations permit easy, accurate readings; the scale is also angled back 15° for improved readability. The cartridge tube's massive 5.00mm inside bore and filter system allow for clean, unrestricted mercury flow and reliable performance. The innovative EZ tube and reservoir lock simplify safe instrument maintenance and guarantees user safety. The manometer features a graduated unbreakable plastic cartridge tube for ultimate protection against mercury spills. The included AdCuff™ latex-free nylon cuff boasts the innovative Size Guide™ marking system to prevent mis-cuffing. Choose from cuff sizes infant, child, small adult, adult, large adult, and thigh, all available in black. The included 8-foot length of coiled tubing and Adflow™ bulb and valve with filter screen protection are latex-free as well, providing a safe, comfortable, and easy-to-use inflation system. Use the drop-down menus in the upper right corner of this page to select a cuff size. 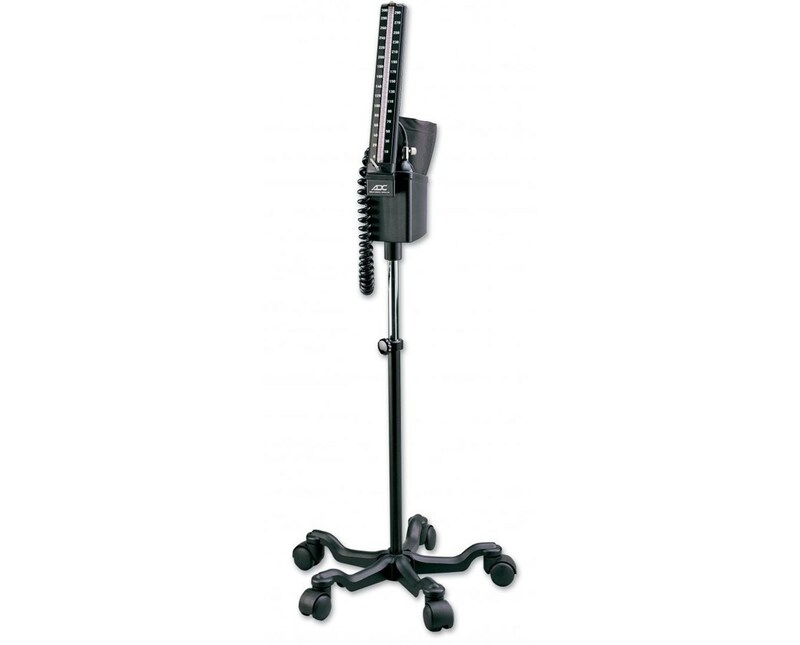 The unit’s convenient mobile design features a mobile stand with a weighted, 5-leg Spider-Leg™ base for stability and 2" casters for easy mobility. 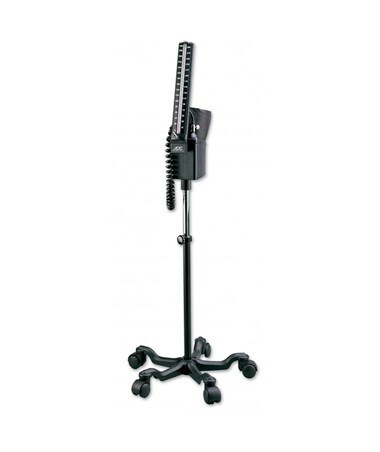 The stand is height-adjustable from 40"-54" to suit users of all sizes. The package is completed by integral ABS cuff storage compartment in the main unit and all necessary mounting hardware. Please contact your local EPA branch for guidance on mercury restrictions that may exist in your state. Base Height adjustable from 40"-54"